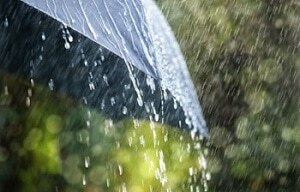 While investigating the mysteries involving the Atlantic jet stream, scientists discovered the reason behind rainy summers. Researchers from The Met Office and the University of Sheffield have detected several possible factors that may have an influence on the Atlantic jet stream, which would also help to predict summer climate on a yearly basis. The strength and position of the Atlantic jet stream influence the summer weather in northwest Europe and the UK. This is a ribbon of extremely strong winds caused by the difference in the temperature between tropical and polar air masses. Dry and warm summers exist when a northward change in the Atlantic jet stream tends to move low-pressure systems northwards and further from the UK. The report, headed by PhD student Richard Hall and Professor Edward Hanna from the University of Sheffield’s Department of Geography, identified that 35% of this variability could be predictable, which is a major improvement that could help to produce seasonal forecasting models. There is nothing people in the UK like to discuss more than the weather. This is because it can fluctuate so drastically - we can be basking in high temperatures and sunshine one week only to be struck by heavy downpours and strong winds the next. Our study will help forecasters to predict further into the future giving a clearer picture of the weather to come. The study findings highlight that the Atlantic jet stream’s latitude in summer is influenced by a number of factors including solar variability, sea surface temperatures, and the extent of Arctic sea-ice, pointing out to a possible long-term memory and predictability in the climate system. We’ve made big inroads into long-range forecasts for winter, but we are still limited to shorter-range weather forecasts in summer. Studies like this help to identify ways to break into the long-range summer forecast problem. The study, published on 24 August 2016, in the journal Climate Dynamics, was financially aided by the University of Sheffield’s Project Sunshine now the Grantham Centre for Sustainable Futures, and was conducted in association with the University’s School of Mathematics and Statistics (SoMaS). Research in the future will aim at establishing the physical mechanisms behind these links and identifying the diverse influences that latitude and jet speed bring to bear on summer weather. The other co-authors on the study were Dr Julie Jones, from the University's Department of Geography, and Professor Robertus von Fay-Siebenburgen, publishing as Robertus Erdelyi, from SoMaS.